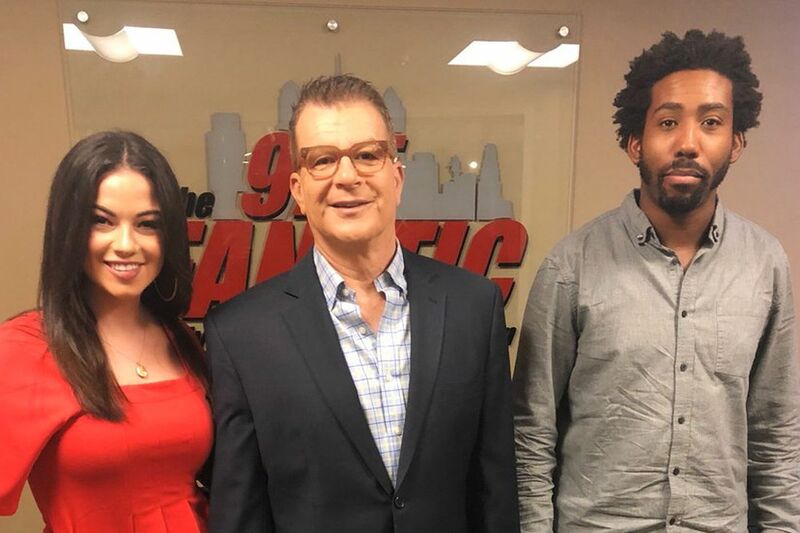 97.5 The Fanatic host Mike Missanelli (center), seen here next to update anchor Natalie Egenolf and producer Tyrone Johnson, reclaimed his top spot over WIP in the battle over sports radio ratings. After losing to WIP's duo of Jon Marks and Ike Reese in the winter ratings book, 97.5 The Fanatic's Mike Missanelli has reclaimed the top spot in the afternoons for Philadelphia sports radio. It was a narrow victory, less than a share among men ages 25 to 54, the most important listening demographic for both radio stations (all numbers in this story are for men 25 to 54). But a win is a win, and Missanelli is certainly enjoying reclaiming the top spot over WIP and particularly Marks, who at one time was a producer on Missanelli's show. "They seem to make the same mistake over and over. Overreact to one good month then wipe egg off the face," Missanelli said. "It's kind of funny." Overall, Missanelli ended the period in third place, while Marks and Reese finished narrowly behind him in fourth. Missanelli's simulcast on NBC Sports Philadelphia, which began on April 16, doesn't appear to have had much immediate impact on his radio ratings. It's not surprising that ratings for NBC Sports Philadelphia are up for that same time period compared to last year, considering the network previously didn't air much programming during Missanelli's time slot. But Philly Sports Talk, with new hosts Amy Fadool and Marc Farzetta, has seen its ratings increase 42 percent among adults 25 to 54 compared to last year, which is at least partially attributed to Missanelli's lead-in. The ratings victory comes just days after Missanelli accused Marks of creating fake social media accounts to trash The Fanatic and spread misinformation about the station's annual Fantasy Fest celebration. WIP called the allegation "false on every level and totally baseless," and neither Missanelli nor The Fanatic could provide examples of fake social media posts. Outside of Missanelli, The Fanatic has been unable to keep up with WIP in any other daypart (outside of the high ratings it garnered airing Sixers playoff games back in April and May). For Monday to Sunday, WIP finished third in the market for the quarter, beating The Fanatic by over three full ratings shares. The Fanatic ended the period in fifth. The days of WIP’s Angelo Cataldi (left) being seriously challenged by The Fanatic’s Anthony Gargano (right) are a distant memory. More than three years after leaving WIP to becoming The Fanatic's morning show host, it appears all Anthony Gargano can do is hope Angelo Cataldi retires at the end of the year. Cataldi and co-hosts Al Morganti and Rhea Hughes finished the quarter more than seven full shares ahead of Gargano and co-host Bob Cooney, more than doubling The Fanatic's ratings. Cataldi finished the quarter in second place, while Gargano finished a distant fifth in the market. Eric Johnson, The Fanatic's program director, has stood behind Gargano since taking over at the station in December. Johnson, citing Gargano's popularity with younger listeners, isn't planning any changes in The Fanatic's morning lineup. "We continue to focus on making the morning show a great listening experience and giving listeners what they want out of sports radio," Johnson said. "Angelo is still clearly a leader in that daypart." WIP's duo of Joe DeCamara and Jon Ritchie continued to solidify their hold on middays with an impressive third-place finish, doubling the ratings of The Fanatic's midday team of Harry Mayes and Jason Myrtetus. The Fanatic's duo actually improved their ratings slightly year-over-year, but still finished five full ratings shares behind DeCamara and Ritchie, which have managed impressive growth after replacing Reese and NBC Sports Philadelphia host Michael Barkann in WIP's midday lineup back in October 2016.